For Non Engineering (Chemistry, English,Library & Information Science, Management, Mathematics, Physical Education*, Physics and Telugu): MSc/ MA/ MBA/ MLISc/ MPEd with NET/ SLET/ MPhil & PhD OR MSc/ MA/ MBA/ MLISc/ MPEd with PhD OR MSc/ MA/ MBA/ MLISc/ MPEd with NET/ SLET/ MPhil OR MSc/ MA/ MBA/ MLISc/ MPEd. time. Based on number of candidates arrived for interview, written test may be conducted. 1 CHE, CE, CSE/ IT, ECE/ EEE, ME and MME 2nd June 2017 Ground Floor, Academic Office, Academic Block-1, IIIT RK Valley Campus. 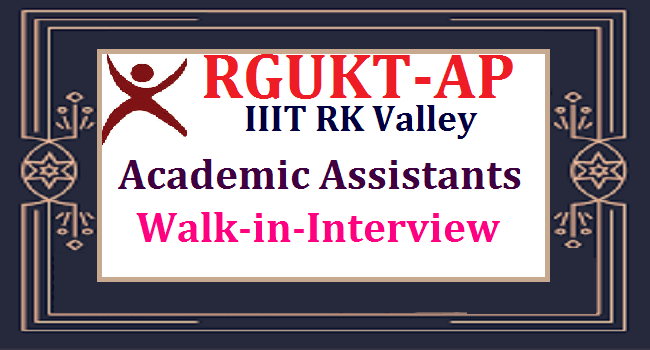 2 Chemistry, English, Library & Information Science, Management, Mathematics, Physical Education, Physics and Telugu 3rd June 2017 Ground Floor, Academic Office, Academic Block-1, IIIT RK Valley Campus. #The idea to create IIITs in Andhra Pradesh came in April 2007, at the request of the Chief Minister of Andhra Pradesh. He was dissatisfied with the opportunities available to the rural youth and wanted to set up at least three IIITs in the three regions of Andhra Pradesh which would ensure better opportunities for rural students. #A Task Force was created under the Chairmanship of Prof. K.C. Reddy. This Task Force produced a report to the government recommending the structure and functioning of the proposed institutions. In March of 2008, the AP Government created RGUKT by an act of the Legislature as a full-fledged university which would initially admit roughly the top 1% of the rural students into the three residential campuses. #To make special provisions for integrated courses including Humanities, Social Sciences and other interdisciplinary areas to impart broad-based education including soft skills. #To function as a resource center for knowledge management and entrepreneurship development in the emerging technologies. #To establish close linkage with industry to make teaching and research at the institutes relevant to the needs of the economy, at national and global levels.